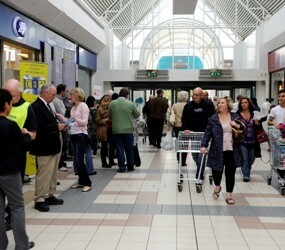 THE Avenue Shopping Centre in Newton Mearns has adopted East Renfrewshire Good Causes as its nominated charity for 2012. The link up means that all funds raised from charity events held within the Avenue throughout 2012 will be donated to the local charity to the benefit of the local community. East Renfrewshire Good Causes is a fundraising charity founded by Russell Macmillan, a local blind, double transplant recipient (pancreas and kidney) to say ‘thank you’ to society for his new life. Michelle McCabe, Centre Manager at The Avenue, said: “The Avenue has a long and proud tradition of raising considerable funds for charitable causes thanks to the generosity of the people of East Renfrewshire. “The Avenue prides itself in playing an active role in the local community and is committed fully to ongoing community engagement. Anyone wishing to make a donation to East Renfrewshire Good Causes, or anyone requiring financial support from the charity, can find out more by logging onto www.ergoodcauses.co.uk. The Avenue is home to 44 different retailers including: banks/post office; books; children; clothing/fashion; food and drink; health and pharmacy; jewellery and gifts; mobile phones; newsagent and cards; opticians; perfumery/beauty salon; restaurant and coffee; shoe and repairs; handbags/ luggage and travel. It is open until 7pm every Thursday with 1,000 free car parking spaces (including underground) seven days a week.